Bit of background on the Clans. Also, a few strips back a reader suggested using the uncolored pages as a coloring page. I meant to share that with strip #400 but spaced on it. 😡 Bit lat,e but here’s a hi-res uncolored version of strip #400. Feel free to print and color it if you so desire. The four Clans are loosely based on the premise of Mind Soul Heart Body (in the same order listed in panel 5). If I were to place them into a framework of the four classic Western elements, Tel'Dora would be Water (fluid and adaptable), Mor'Kama would be Air (restless and ethereal), Jin'Sorai would be Fire (passionate and dynamic), and Sar'Teri would be Earth (conservative and solid). Selkie gonna use a fork this time, or is she gonna eat with her fingers? 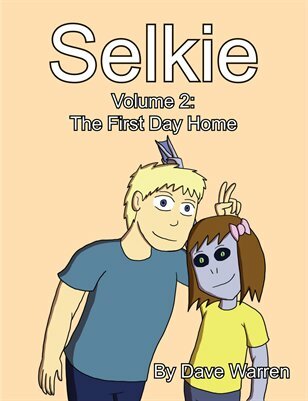 I can totally see Selkie growing up to be a seriously avant-garde artist. Maybe even a performance artist. She’s so avant-garde she never takes off her performance makeup! “This is my face.” Look at how committed to the role she is! I like how, despite what little we know of the war etc (I could have taken away something entirely different than other people from the nuggets of info we’ve gotten thus far) Pohl still says “Except maybe the Sar’Teri.” To me, that “maybe” that he put there says a lot about Pohl’s outlook and disposition. I think it also says a lot that he’s still describing Sar’Teri as “Peacekeepers”. I was suggesting that using the more positive peacekeeper term means he still thinks of them as keepers of peace, rather than makers of war, or enforcers of tyranny. presumably outside their reach now, he’d speak his mind. First thing I thought of when I saw the word “peacekeepers”! Yeah, I know about the problem. I am waiting on feedback from the guy who creates Comic Easel before I implement a reader-suggested fix. Long ago, the four nations lived together in harmony. Then, everything changed when the Sar’Teri attacked. Only Nei Li, master of all fishies could stop them. But when the world needed her most, she vanished. Bys yours fishies combineds, I’s Captain Nei Li! So, those four are all the clans, huh? I noticed the phonetic pattern in the two that we had already heard about, and I wondered if clan names doubled as surnames — in particular, whether Cho’Gori (Gein) and De’Madiea (Pohl) would also turn out to be clan names. I’ll expand on this later, but short answer is that there are sub-clans within the four Major Clans. Also, and some surnames are just individual families and not clans in their own right. If the Jin’Sorai are artists and crafters … and the Sar’Teri exterminated them … wonder what that says about the Sar’Teri. In unrelated news, I’d like to see what Mor’Kama and Sar’Teri skin and eye colors are. Wild guess: Selkie has a weird accent because she was taught to speak in a Sar’Teri accent? Maybe so she would be labeled an adoptee or something? I dunno. Either way, I can see laborers, which are usually lower class, having a less pristine grammatical structure to their way of speaking. If the anatomical sketch is still canon, then the Jin ‘Sorai clan must had been very small to begin with. So, why would a clan of laborers and “peacekeepers” wipe out a clan of artists and crafters? Because artists and crafters are always the first to push for cultural changes. Well, never trust those creative types… Riot just waiting to happen. Best guess? They were seen as expendable. Pretty sure Sarnoth is far too big for the lake it’s in (too many mouths to feed etc. ), and I’m betting it’s caught up to them in a bad way. See my reply to Eve, though. That may come back to bite them a little farter down the road. I really hope it was for an interesting, compelling reason, if only to avoid the “armed-forces-are-evil” stereotype. I dislike that characterization not because it’s unflattering to our own army, but rather because it’s unrealistic. Most armies (especially those who belong to a healthy, prosperous nation) are completely dependent upon the general populace for recruitment and supplies; without civilian support, any decent armed force is faced with a logistical nightmare. If you try force that support gunpoint, you’re just begging to be sabotaged or abandoned at every conceivable opportunity. I seriously doubt the massacre made the Sar’Teri very popular; they would have needed to be pretty stupid to alienate everyone else in Sarnoth without a darn good reason. I’ll say this, there’s definitely a class of people who have no higher ability or aspiration than just basic labor.. and we need to stop shaming those people and telling them to ‘reach higher’. SOMEONE has to do that work, and some people are suited for it. as long as nobody’s forced into anything..
Well, to be fair, you won’t ever have a great life working in fast food. Low pay, bad hours, little to no benefits… not to mention your retirement fund will be incredibly low. Most people in fast food barely hit ends meet and are so far into debt or poverty it isn’t even funny. This is all assuming that’s ALL they ever did in life. You can possibly hit a manager position, but even then the pay won’t be anything incredible. Picked up on this issue from Shortpacked and googled for an article, but apparently One Wal-Mart is holding a food drive for it’s own employees to have food for Thanksgiving. The clans kind of remind me of Harry Potter. They do seem similar to Ravenclaw, Griffindor, Hufflepuff, and Slytherin with what little we know about them so far. While gryphons are my favorite, I love many creatures, and snakes hold a special place for me. 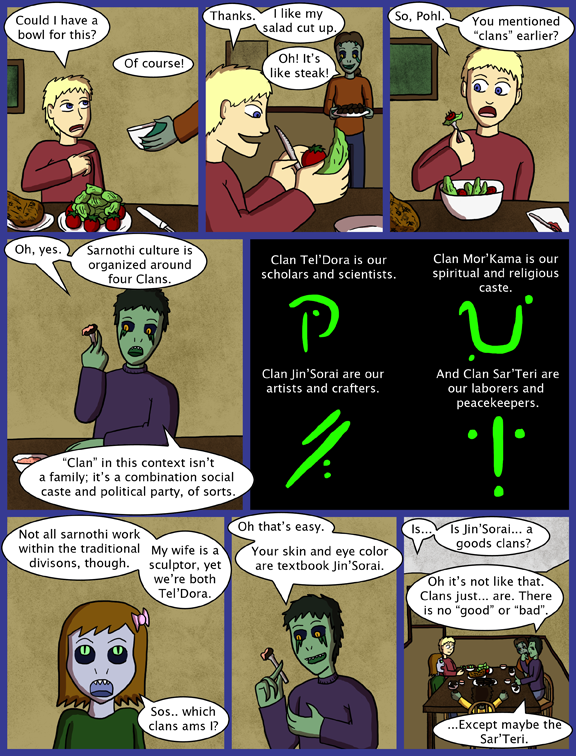 Back with another question: what’s the sarnothi opinion on inter-clan marriages? Frowned upon? Accepted? Depends on which two clans are marrying? Opinion varies from person to person? Marriage within sub-clans of the four Major Clans: No issue. Inter-marriage between the Major Clans: No legal repercussion, but socially frowned upon. That was my guess, too — if intermarriage were common, then the skin and eye color wouldn’t be a reliable indicator for long.